Sundial and clock time would only coincide if the apparent path of the Sun were flat and circular. It is primarily the elliptical and tilted path of the Sun which gives rise to the equation of time. In centuries past horologists (clockmakers) developed mechanisms to illustrate the equation of time. Sauniers 'Modern Horology' 1861 has an excellent engraving of the equation mechanism. 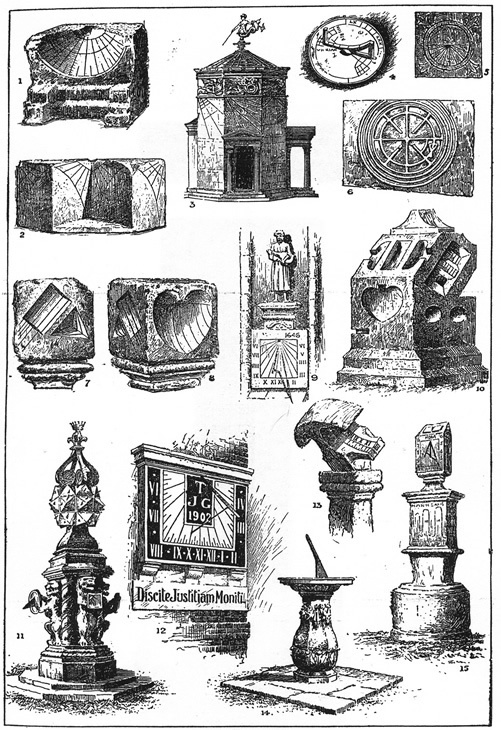 See also Eric Bruton 'The History of Clocks and Watches' , also Alan Lloyd 'The Collectors Dictionary of Clocks' . Pliny mentions that it was Hipparchus who discovered the irregular motion of the Sun and developed the equation of time. Hipparchus is regarded as the greatest of Ancient astronomers, active around 160B.C. He also developed trigonometry - both plane and spherical, the latter being vital for navigation. The level of Alexandrian learning at the time of Pliny and Hipparchus was only surpassed 1,500 years later. See Charles H Cotter 'A History of Nautical Astronomy'. The Saxons divided their sundials into 'tides' not hours, comprising 8 tides to cover day and night starting with Morgen at 04:30 to 07:30, then Daeg-mael, Mid-daeg, Ofanverth dagr, Mid-aften, Ondverth nott, Mid-niht, and lastly Ofanverth nott, all of three hours duration. Astronomers have long used 'clock stars' to get a measure of 24 hours, certain stars that remain fixed, these marking each period of 24 'sidereal hours'. If you've missed it see my 'EQUATION OF TIME' engraved brass plate. Here's a picture from my Grandfather's old Harmsworth Encyclopedias circa 1905. I find these illustrations wonderful and full of charm. I hope you think so too. Greek (from the Tower of the Winds Athens), executed about 50 B.C. by Andronikos: lines of dial chiselled on wall under frieze. Early English: St. Michaels, Winchester. Early English: St. Cuthberts, Darlington.